nj eats: Got Pork? Yucatan-style? 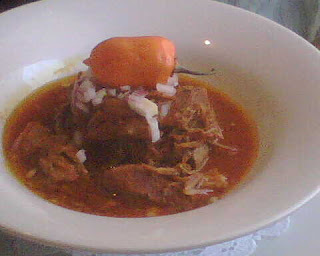 I have always been a huge fan of cochinita pibil -- that fiery, tender signature pork dish from Yucatan, ever since that fateful first bite I took in Merida, the Yucatan's capital. So it was only natural that I ventured out to find the best cochinita pibil in LA that would remind me of those days strolling around the streets of beautiful Merida with a happy stomach. Yuca, the shack in Los Feliz on Hillhurst serves a decent snack-sized burrito version of the dish, and I like it, but it isn't nearly as spicy and sumptuous as the real deal. I had been to the original Chichen Izta in Mercado La Paloma years ago and with all the hype about the new Chichen Izta (named after the vast Mayan ruin in the Yucatan Peninsula in Mexico that you should visit if you ever go there) that opened up near McArthur Park, I had to check it out. First of all, the decor is significantly more shi-shi than its original and so are the prices. 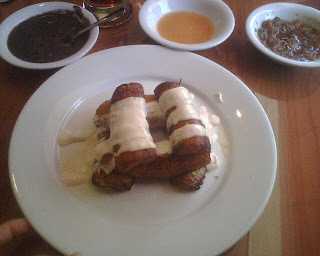 I would have been completely satisfied with the plantains with crema I ordered as an appetizer, had it not been for the fact that our waiter neglected to tell us both our dishes already came with plantains. Strictly on taste, consistency and texture, however, the plantains were good and perfectly ripe -- not too hard or soft -- and the crema added a bit more decadence to it. Minus one point on service. Back to the food and drinks. 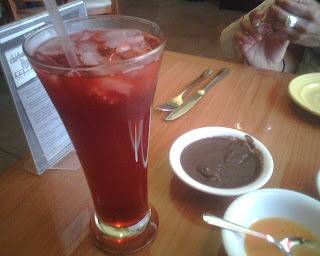 The blood-red Jamaica drink was very refreshing and not too sweet, which nicely complemented the cochinita pibil taco I ordered. 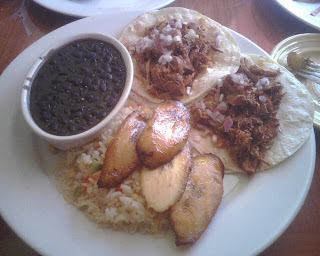 Now for the star of the show -- the cochinita pibil taco, which came with black beans, "confetti" rice and yes, plantains. The pork was tender enough, but some of the fat was still attached to the meat, which was cumbersome and not something I saw in the Yucatan version. The marinade was not as spicy as I remembered it either, so it made me want to add more salsa -- a standard roasted tomato salsa and an innocuous-looking orange habanero salsa that belied its potency (For the record, I only managed to dab into the habanero salsa and that is all this spice-loving person could muster). The texture of the pork was good enough, but I wanted more flavor. The beans were fine. The rice was a tad dry and bland, but it looked pretty with the red and green veggies that made up the "confetti." My friend who had the stand-alone dish without the taco liked it. I suspect hers was juicier because as you can see, it came in a pool of its own juices, whereas my taco was a bit drier. Maybe I should have known better than to order a taco version. I also had a minor correction with the bill as I was charged for an extra order of plantains on top of the appetizer I did order. Maybe they needed to unload a surplus supply. They apologized and made the correction immediately. Another minor service issue: I got some leftovers to go, and when I opened the box to eat it for lunch the next day, they had poured everything -- including the beans, rice and plantains -- in one blob without separate containers. It basically became a rice and beans mix, which came off as the management not appreciating the way certain foods should be eaten and a lack of attention to detail. Ok, maybe I need to lighten up, but I notice these details because I know some restaurants that are cheaper and do it better. All in all, I may consider returning to the original one and trying it out again, but not sure about its fancy cousin. It takes at least five hours of cooking in the oven for all the flavors of the marinade and pork to marry and transform into a divine melt-in-your-mouth concoction bursting with juicy, spicy flavor. Maybe I need to try making it at home if I can't find anywhere that makes it as good as in Yucatan. Stay tuned as the search continues. 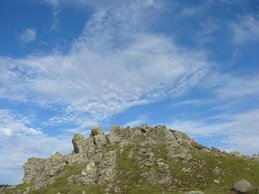 Beware: you should only read this blog on a full stomach! persimmongirl, thought you might be our london friend. please convince ironchef that we should visit you in spring 2008.
do you mean to say you'd be embarrassed to be seen w/two face-painted people wearing red and a flag as a cape? i see the english need to inject some more "footie" spirit into you. omurice is bracing for beck's arrival to la. i hear zizou may consider joining him, in which case i'm so there. I'm not a huge fan of Mexican food, but these dishes look so good!